First-time visitors expect to see trees festooned with orchid flowers. But orchids are only one type of epiphyte, and there are thousands of different species of those. Other epiphytes such as bromeliads, philodendrons and ferns also contribute to the biodiversity. However, the forest canopy, comprising the crowns and upper branches of trees is virtually unexplored so the overall species richness of Amazon epiphytes is unknown. If lower plants such as algae and lichens are counted, the true number is likely in the tens or even hundreds of thousands of Amazon epiphyte species. This picture shows the diversity of plants that grow as epiphytes. Low on the trunk are arums and philodendronswith heart-shaped leaves. On the middle and upper branches cluster groups of orchids, bromeliads and ferns. The long roots (right) dangling from the crown probably belong to philodendrons. 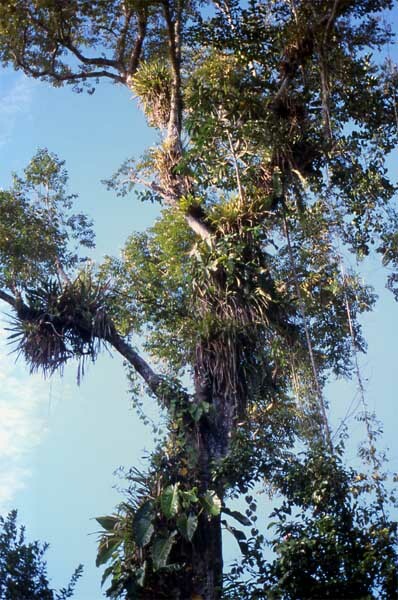 As a tree ages, its epiphyte load increases until its branches are virtually obscured. Here is a forest within a forest. 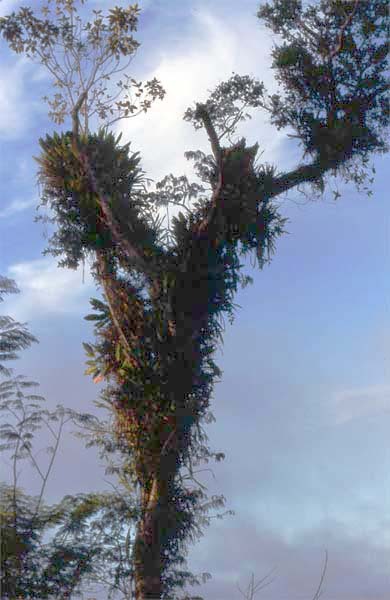 Most plants on this tree are probably orchids, bromeliads and ferns. Different habitats support different plant species. Here in the Andes mountains (see background) in Ecuador, the trees support a range of epiphytes quite different from those on lowland trees. 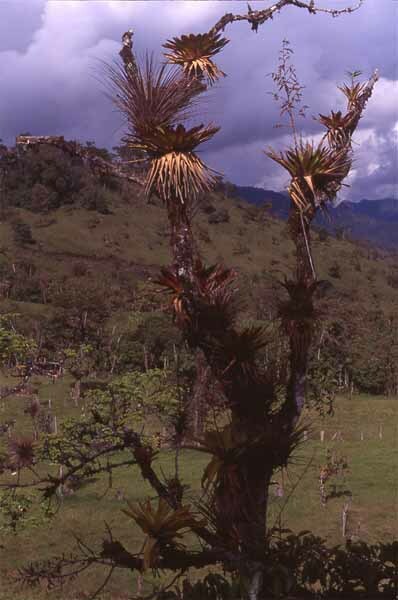 These epiphytes must endure harsher conditions so bromeliads dominate (the plants with broad pointed leaves), one of which has just ended flowering (top right of picture).